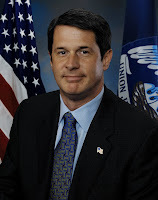 This week, US Senator David Vitter has shown the rest of the country what we have known here in Louisiana for some time. Vitter has proven again that he is a skilled legislator who is fiercely loyal to his constituents and refuses to back down from any fight. Against the likes of John McCain, Ted Kennedy, and his own President, Vitter, and four other junior GOP members, took on a flawed immigration bill that was being stampeded through the upper chamber and wrestled that bull to the ground. Viva Vitter! Junior GOP Senators Defeat Old Guard (Washington Times) - Mr. DeMint, Mr. Vitter of Louisiana and Sen. Tom Coburn of Oklahoma, all of them in the class of 2004, spent hours camped on the Senate floor protecting their rights, objecting to Democratic requests and generally making life difficult for Majority Leader Harry Reid, Nevada Democrat. Immigration Debate Kindled New Kind Of Rancor (SF Gate) - "Eighty percent of the American people were against this bill," [Vitter] said. "For anybody to suggest that was about racism, I think itself is the height of ugliness and arrogance." Senate Hands Bush Major Defeat On Immigration (Reuters) - "The next step is to immediately push the president to take up his word and enforce security at the border," said Sen. David Vitter, a Louisiana Republican who help lead the fight against the bill.